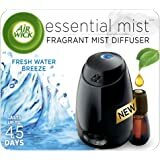 Amazon's Choice for "airwick essential mist refill"
1. Lift cover. Insert batteries. 2. Insert refill upright until it ‘clicks’. 4. 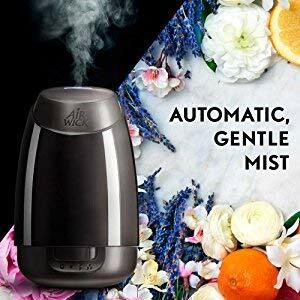 Enjoy automatic, fragrant mist. The device does not mist continuously, but intermittently during its 8 hour cycle . 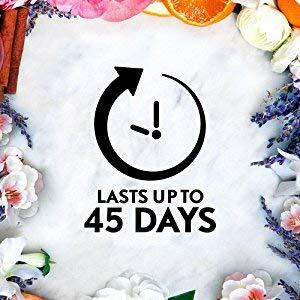 The mist duration and frequency have been carefully designed to deliver the optimal fragrance experience with up to 6 weeks of coverage per refill. 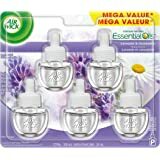 Provides up to 45 days of long-lasting fragrance per refill on low setting. Batteries last for 135 days on low setting. 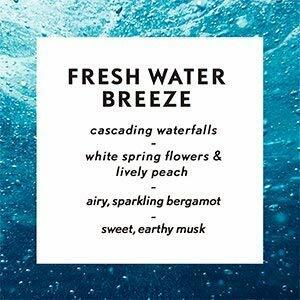 Capturing the freshness of a cascading waterfall with pure & clean aquatic notes, subtly blended with airy, sparkling bergamot, orange & green fruity aromas. 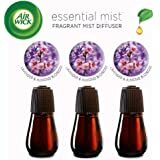 As Air Wick Essential Mist transforms natural essential oils into a gentle mist, feel a more natural & sensorial fragrance experience surround you. 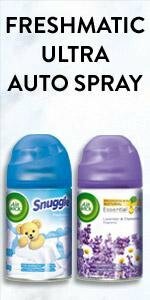 Transforms natural essential oils into a gentle, automatic fragrant mist to surround you with fragrance. Refills Available In 5 Premium Scents Inspired by Nature: Lavender & Almond Blossom, Fresh Water Breeze, Mandarin & Sweet Orange, Peony & Jasmine, Cinnamon & Crisp Apple. 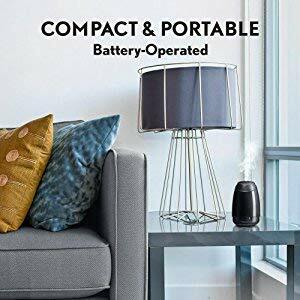 A compact design that is battery-operated. Making it portable and safe to fit in small spaces. 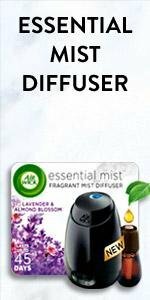 Adjustable intensity and frequency of mist for a room that is fragranced just right, no matter its size. Such as living room, kitchen & office spaces. With a sleek & contemporary design that matches & enhances your decor. 4.0 out of 5 starsSmall,, powerfull but best of all, Silent! 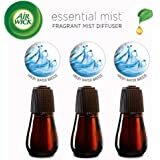 Love this little Air Wick Essentials Mist Kit scent diffuser. 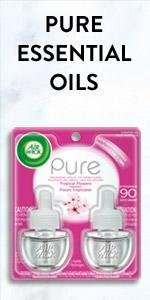 I recently purchased it and was surprised by the product size and the great scent. Its not for anyone who suffers from migraines however, the lavender is not overpowering. 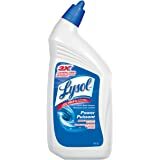 Great for large rooms because even on the lowest settings, it fills up my full apartment. Overall, I recommend it because it is small and cute but powerful. Hide it or show it because the best part of it all is that it is silent! 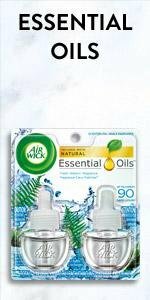 The packaging for the Air Wick Essential Mist Kit is attractive and inviting. I also found it extremely easy to open, which was a nice surprise. 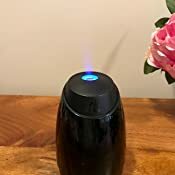 The directions for use were easy to follow, and my diffuser was ready to go very quickly. This kit is super easy to use. When the mist is spraying, it emits a blue light so you know it is on. The scent is the mist is powerful enough. The lavender and almond blossom scent was not really to my liking, so I did not enjoy it too much. However, the unit itself is nice and I would give it another go with a different scent. It is also nice that the unit is small, so it doesn't take up too much space at all. 5.0 out of 5 starsThe perfect air freshener! 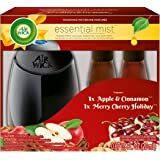 Of all the Air Wick products that I've tried, and others similar to this from other brands, this is the one that I'll continue to use. 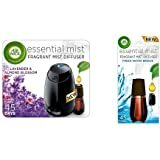 Compared to the others, the scent isn't too overwhelming, especially upon the diffuser misting. Others are way too strong when it emits the fragrance that I usually feel nauseous, but this one is great. 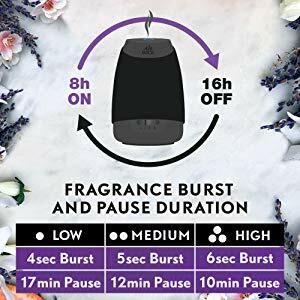 It's also very quiet that I don't even realize that it has actually dispensed any fragrance where other similar products are "loud" in the sense that I could always hear them. 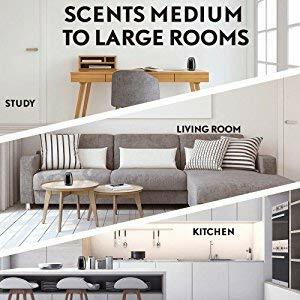 I really like how this product is effective and also subtle enough for those who may not like such strongly scented air fresheners, but still fragrant enough to create a lovely scented environment. 3.0 out of 5 starsInconsistent results. It works, but there are days where it seems to heavily scent the room, and then there are days where it doesn't seem to make a difference. I can't get a consistent experience out of it. 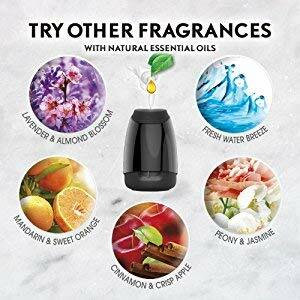 The scents are OK as well, I have tried multiple ones. 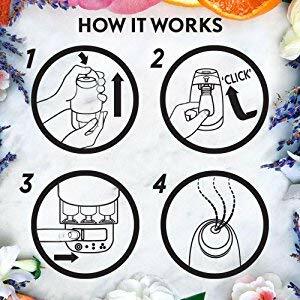 The product could be improved with a button to release some scent immediately which would help on the days it doesn't seem to do much. 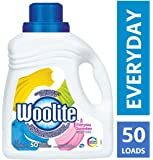 Bought this for reviewing purpose and having a rebate. 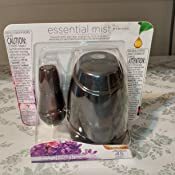 I found it small for an essential mist so this is great for small room. 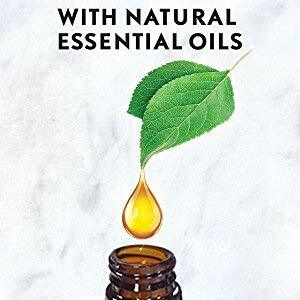 The lavender oil that comes with it smells so good. 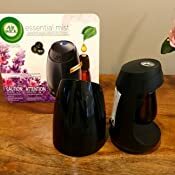 And It’s so easy to use, doesn’t need to drop the oil but rather putting directly the bottle into the mist. Great for bedroom than living room when it comes to space. 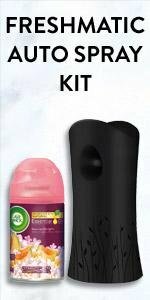 The idea behind this Mist Kit is great, however the product itself isn't all that great. 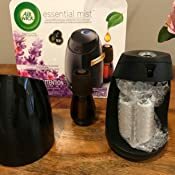 It does mist to the preferred setting interval (anywhere from 7-17 minutes), and smells great when you're standing right in front of it and it mists, however it then just falls to the ground and the scent is gone until the next interval. 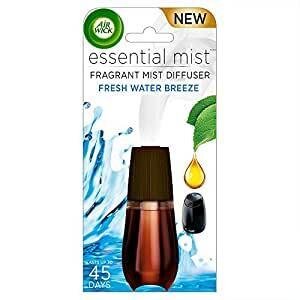 It does smell great but would almost be better with a continual mist for at least a few minutes rather than one spray into the air and then done. Perfect. Only wish it was a plug in. Battery still lasts pretty long. But it’s just a hassle to remember to check them to see if they are working. Smell is never overpowering and does not dirty surrounding floors or tables with oil. It vaporizes. Do not buy sprayer models!! Lesson learned. 5.0 out of 5 starsThe perfect amount of scent. Cannot handle scents, as I get migraines from them but needed something for the mud room/ entrance. Something to mask the smell of smelly sports things. This is awesome. I have it on the lightest of mist and it’s perfect. Must be in during the day, don’t understand how the 8 hour timing works. But it’s not on all the time. Doesn’t smell fake. I got the mandarin one.